Shortening Shocks - NGWClub®, Inc. I had some spare time on my hands (laid off for a few weeks) So played with shocks. First I have to thank Whiskerfish for the shocks. Without him I couldn't have done this. Tools you need are coilspring clamp. Got mine at harborfreight for 11.00 on sale. 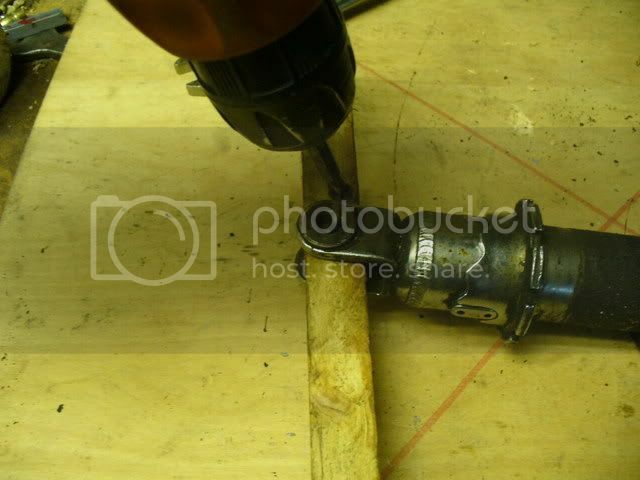 Hammer, wrenches,visegrips, hacksaw, metric die that match's thread and cutting oil. 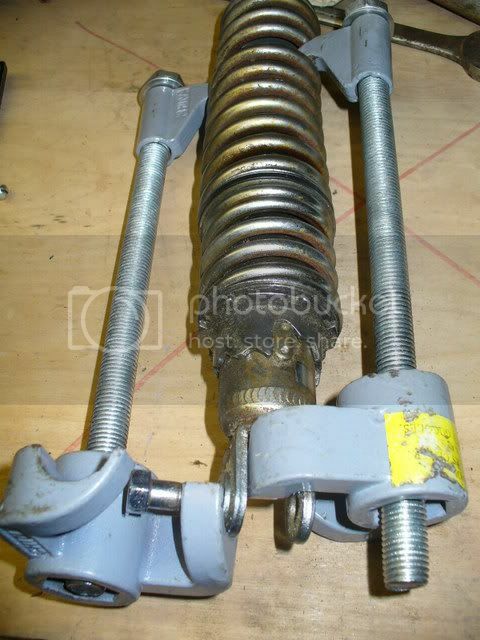 Take shocks and put spring compressor in spring. 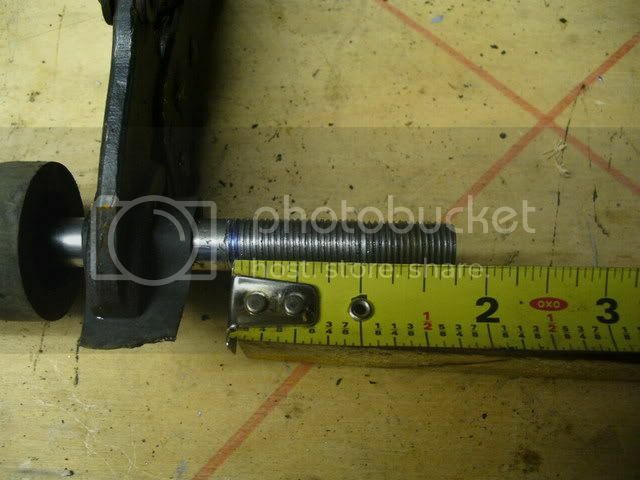 One will fit in saddle, screw a bolt into threaded part of saddle. 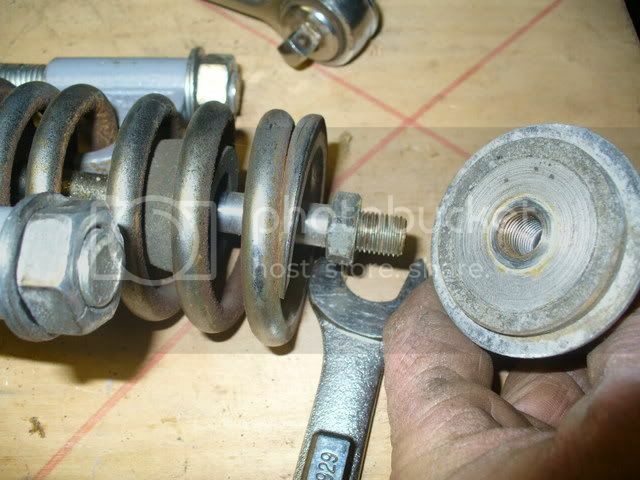 You will only need to compress spring enough to get a wrench on the nut on the shaft. When nut is exposed put your wrench on it. ( mine was 17 mm) Now put a round object in hole. Smack it with a hammer to break it loose. (ratchet I used was a junk one). When you get it apart (release spring clamps) take visegrips with a piece of rubber so as not to mar shaft. Brake nut loose and remove. 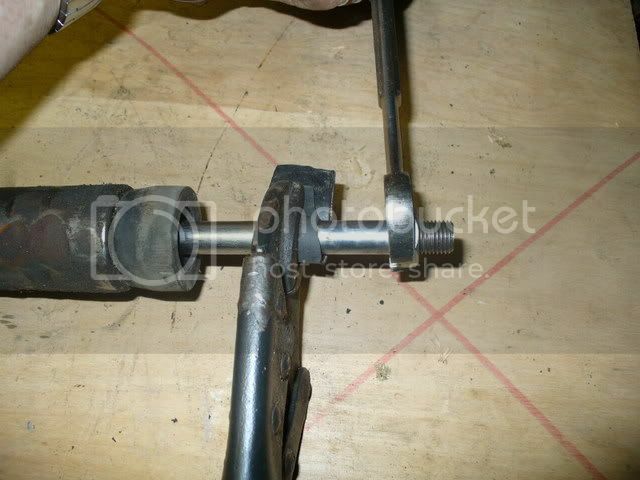 Now fasten shock to bench with shaft hanging over edge so it will not move. Measure the threads mine were 3/4 in. 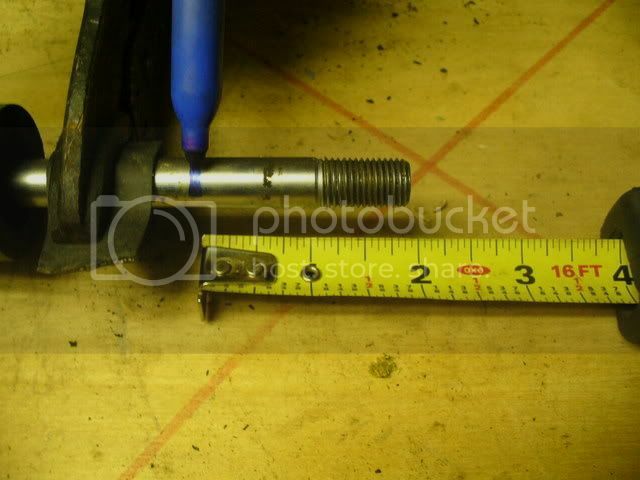 Add an inch that would be 1-3/4 in and mark on shaft. 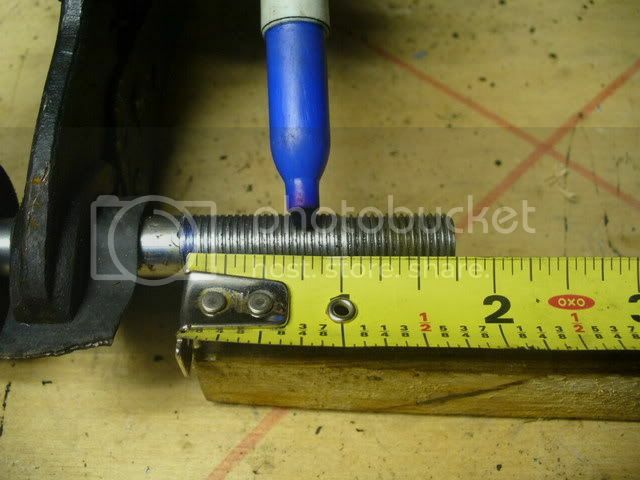 Now take your metric die and cutting oil and rethread shaft to mark. Now reassemble in reverse order. Shocks will be 1in. shorter. Just a note Not all shocks have same thread. Allso some shocks do not have threads at all they are pressed in. 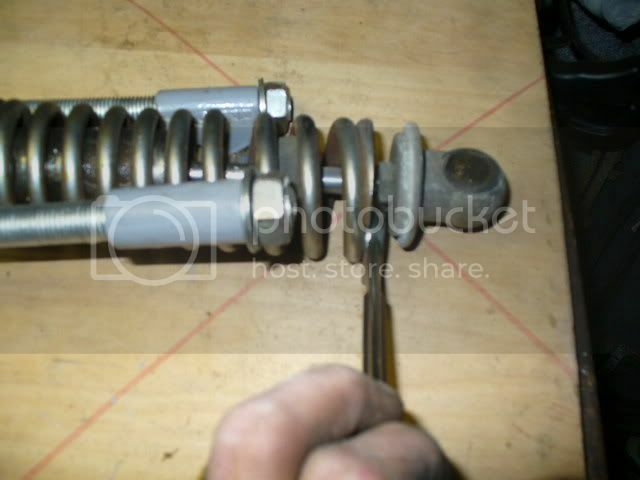 So if you try this make sure you have shocks with threaded shaft. My threads were 12-1.25 mm. Like I stated some are different sizes. Again my thanks to Whiskerfish for shocks. Shocks cleaned up nice Steve. Awesome write up!!! Now I just have to decide if I'm going to keep the air shocks that were on her or find something else!!! Excellent Write up!! Gald I counld contribute! interesting concept. how does that effect the travel of the shock? any chance of it bottoming out? 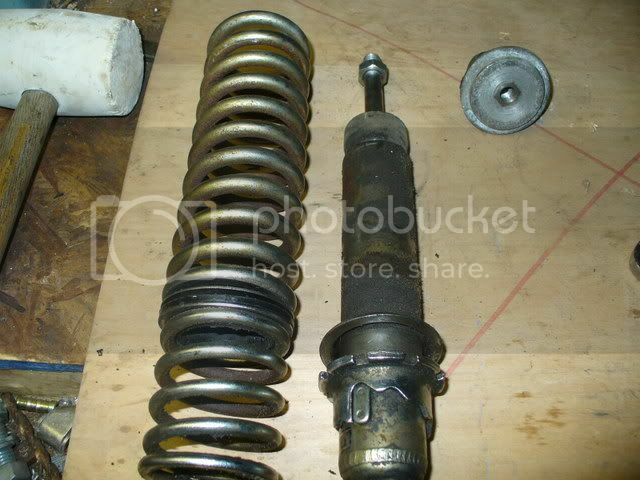 have you also shortened the spring by 1 inch? 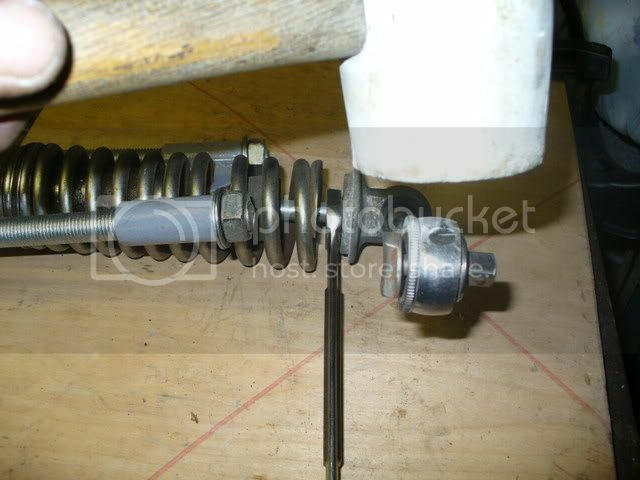 and have you thought about leaving the spring the same length and compressing it more? Good writeup with excellent pics. Cyborg I left the spring the length it was. As for bottoming out I don't see a prob. As this is for my bobber. Its a solo bike and due to my (awsome) body structure should work fine for me. I'm 5-10 160lbs. take a 30 waist pants. 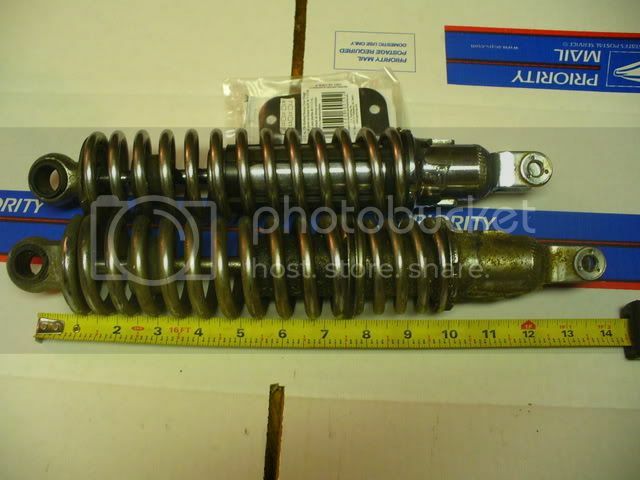 I could prob just use a spring . I don't think I would use it on a 2 person bike but will try it this spring and see. Right now we have 12ft. snow banks so trying now is out of the question. 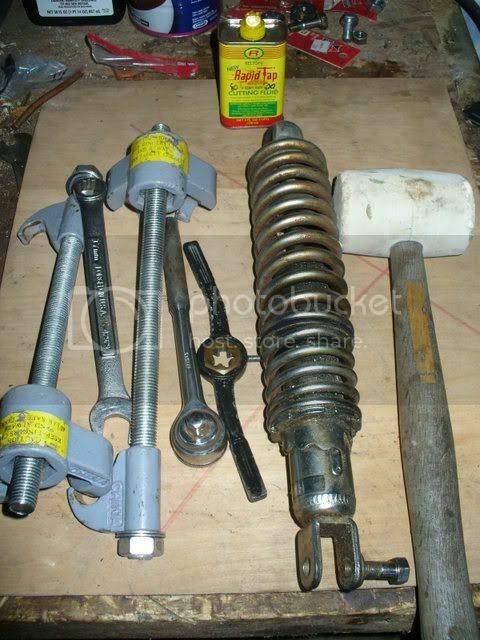 I have some spare shocks that I would like to try that on..............I had success compressing the springs with some giant worm clamps(? 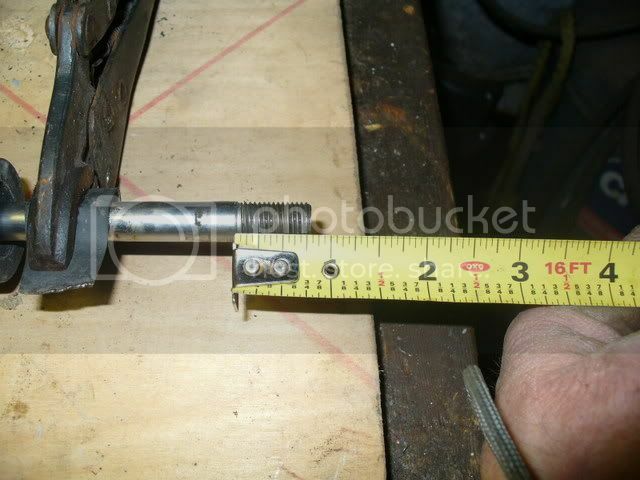 ), you know like hose clamps, if stretched out they are probably 18" long. Just make sure you have right die some are 12mm found some with 10mm and one realy weird one with 11mm and thats is a weird one. 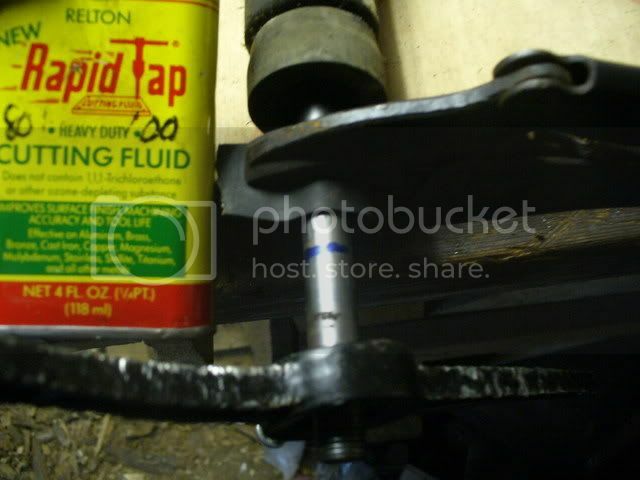 Fantastic........ and you'd never have been able to do such a good job without the Rapid Tap. That stuff rocks !!! Do you think going two inches would be too much? Won't leave much room for travel. Mine are working great with just a little over an inch shorter. Your welcome glad I could help save you some cash. Will this help us riders with the short leg/balance on tippy-toes problem?